It’s time to take a close look at whether your website is optimized to convert leads into customers. Following these best practices reduces the number of visitors who bounce off your website and engage with one of your competitors instead of you. They are standard rules that KickCharge Creative, a web design company in NJ, follows for every website we build. You want a site with these key characteristics. 1. Phone number: Make sure your phone number is prominent, preferably in the top-right corner of the site. It should always be accessible, even after the visitor starts scrolling down the page. On mobile devices, it could appear as a phone icon in the header that will dial the number when it’s clicked. Don’t put multiple phone numbers on the website if it’s not absolutely necessary, and use a number that’s exclusively for the website to track the number of unique callers who found you online and measure growth. The call-tracking phone number is prominent in the top-right corner of Tonna Mechanical’s website. 2. Contact form: Let’s face it. These days many folks consider it taboo to talk on the phone. Plus, it’s very likely they’re shopping online at off-hours or in places where it’s impossible to make phone calls. But they don’t want to wait until business hours, when they’re otherwise occupied, to reach out. So, you should make it convenient for them to send messages to you via a simple form. Just like that, your potential customer has crossed that task off of his list and the ball is in your court to take the next step. 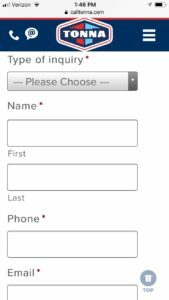 A quick contact form should be easy to find on any page and should not require too many pieces of information. If it’s long and complicated, people may be discouraged from filling it out. Ensure the contact form triggers a thank-you page to confirm that you received the customer’s message and use this page to quantify the traffic sources of those converted leads. 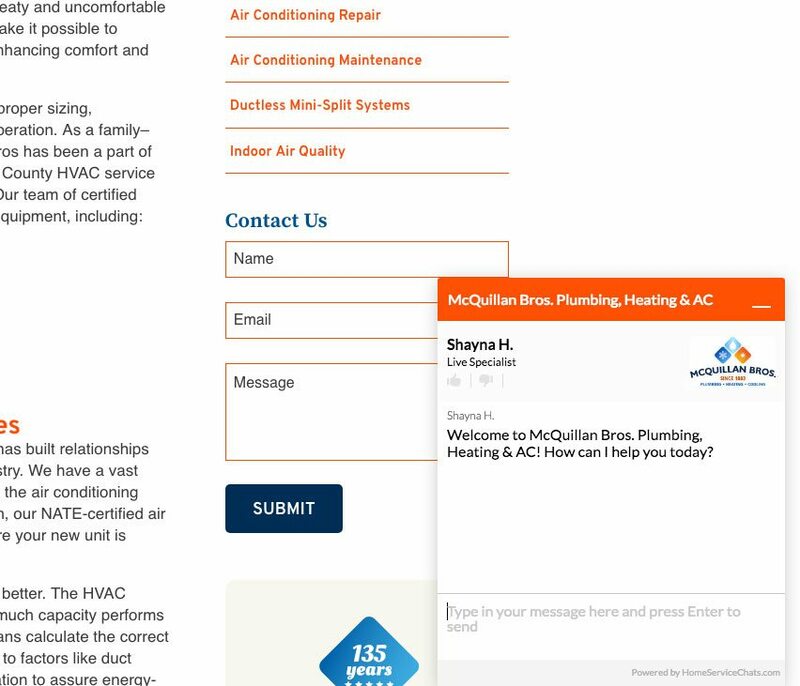 The McQuillan Bros. website uses live chat as well as quick contact forms in the sidebar all throughout the website. 3. Live chat: Kick up the convenience of an online form to the next level by offering a live chat service on your website.Now, your online lead no longer needs to wait to hear back from you, instead getting an immediate response. Using this tool does incur a monthly expense. Several options exist, from vendors who handle the dialogue on our behalf to solutions that rely on your in-house customer service representatives to answer the inquiries. Two-way texting is another solution: the lead completes a quick form on your website that triggers a conversation with your team via text message. It’s convenient because the customer doesn’t need to stay on your website to keep chatting with you. 4. Calls to action: Sometimes, people need a little encouragement to pull the conversion trigger. Cue your calls to action (CTAs). Well designed, appropriately placed graphics and links give leads an extra push to keep exploring your company’s merits or help persuade them that you’re the right choice. Your CTAs should highlight information that lives elsewhere on your website such as customer reviews, special savings offers and available financing. Ensure they are placed on pages where they’ll help guide the lead through the sales funnel. Also ensure your navigation is clearly organized so the services you provide are obvious and website visitors know where to find additional information that answers their questions. 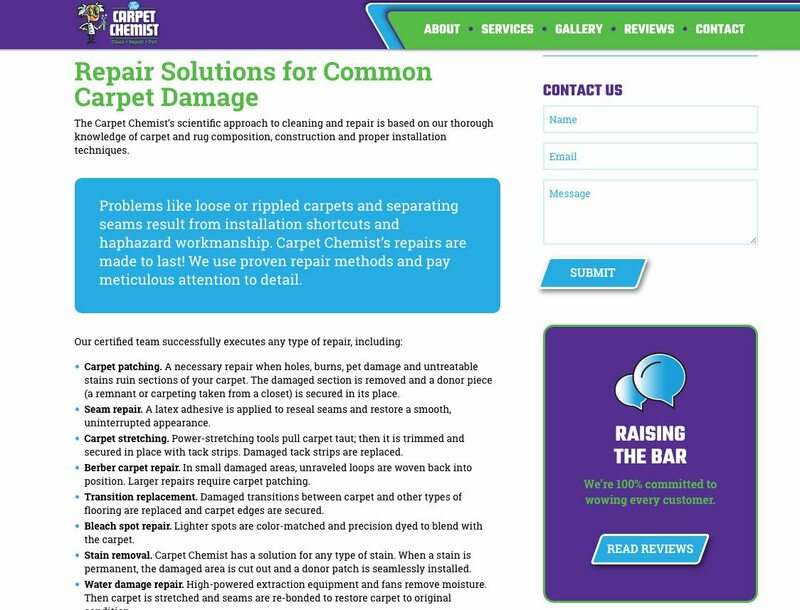 A call to action on The Carpet Chemist’s website (right) encourages visitors to read customer reviews. Forms are easy to complete when visiting calltonna.com on your phone. 5. Mobile-friendly: The visibility and usability of all of these features is just as important for mobile devices as it is for the desktop experience. Don’t sacrifice conversion methods just because the site is loading on a smaller screen. Using responsive design, prioritize the essential lead generation tools so they work well on phones and tablets, too. As experts in building small business brands, the team at KickCharge Creative also preaches that a well-integrated brand strengthens the conversion rate your website delivers. Consider whether your website accurately portrays your brand. When a stranger to your company lands on your website for the first time, what is the message it conveys about your value proposition, experience and trustworthiness? Marrying professional, consistent branding with the five conversion tools described above is a proven formula for a revenue-generating website. When you hire KickCharge to design, write and build your website, our experts in small business brand name development, logo design, collateral and digital marketing will employ these strategies to create an online presence that delivers a healthy ROI. Let’s talk about how to make your website more productive. Contact us online (see what we did there?) or call us today at 800.836.4666.